My good friend Josiah Mugambi in Nairobi was at the Kenya chapter of the Institute of Electrical and Electronic Engineers (IEEE) exhibition in Nairobi last weekend. This is where students showcase their innovation in engineering, ICT, mobile application and renewable energy. He did me a great favor by sharing some pictures and research that he did on some of the really interesting students he came across. 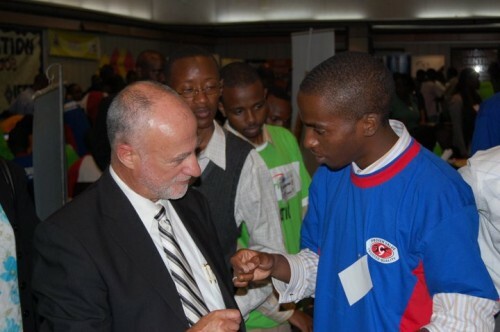 Safaricom CEO Michael Joseph was especially interested in this one for obvious reasons. Denis called it ‘nakupesi‘, Naku for Nakumatt (the local mega-store). nakupesi is an online shopping mall, with payment based on MPESA. 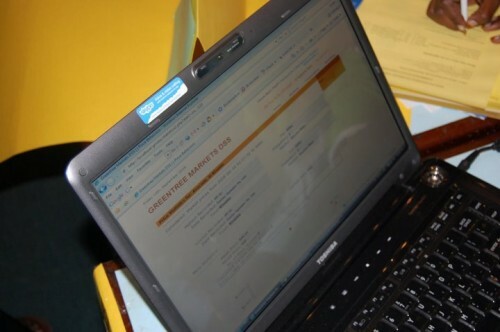 One would need to be registered on MPESA to be able to pay for items online via MPESA. One thing that is possibly lacking is delivery to one’s residence or office after purchase. This shouldn’t be too hard to incorporate though. This looked quite interesting – A business intelligence tool that allows a farmer to choose where to sell his produce based on price, and location. Some of the obstacles that the developer Andrew Owuor mentioned include the need for real time market data from markets round the country, for the system to be of use. This isn’t a completely new idea, but it’ll be interesting to see what local twists are created for East Africa. Jemimah has developed a system that automatically dips two vehicles head lights when approaching each other at night. Josiah has ranted about headlights before, and I agree, it would be very useful and potential could reduce some accidents on those dark lightless roads around Kenya. Sammy Njoroge’s demostration of a synchronous solar heliostat used to track the sun, and orient a solar panel accordingly thus improving the efficiency of solar panels. Automatic tracking of the sun to increase the efficiency of solar panels, Makes economic sense. Innovation runs in the family it seems. Africa Telcom News has released a free report, called the African Mobile Factbook, that gives all of the major numbers on subscribers, penetration rates, profitability and growth potential for every African carrier and country. As anyone who is tries to do research in this space knows, it can be difficult to get some of these mobile phone statistics for Africa, so this is a welcome source for information. African states with less than 600,000 subscribers and includes Burundi, Cape Verde, Central African Republic, Comoros (Union of the), Djibouti, Equitorial Guinea, Eritrea, Gambia (The), Lesotho, Liberia, Mayotte, Sao Tome and Principe, Seychelles, Somalia, Swaziland and Rwanda. 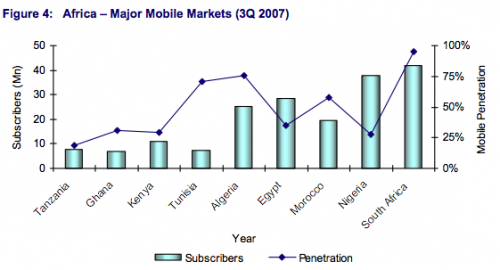 At the end of 2007 there were 280.7 million mobile phone subscribers in Africa, representing a penetration rate of 30.4%. The chart below shows the historical numbers up until 2007, with projected growth and penetration rates through 2012. Even more interesting, when you look at the major African markets, is to see the huge growth potential for areas that are already very profitable. As can be seen Nigeria, Kenya and Egypt have the greatest growth potential. There are (or will be) a staggering 11 mobile phone operators in Nigeria, with 4 in Kenya and South Africa, and 3 in egypt and Morocco. 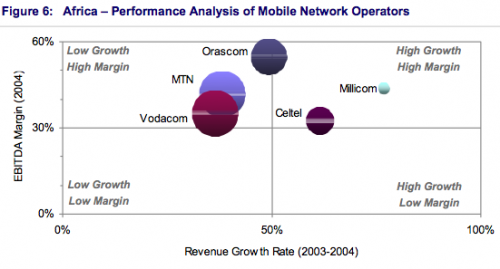 Size doesn’t mean everything though, Millicom has the highest growth in revenues, and Orascom has the highest EBITDA margin, primarily due to its strategy of investing in the emerging mobile markets. The chart below shows five of the leading mobile network operators in Africa in terms of their subscriber base (size of the bubble), revenue growth rate and EBITDA margin for the latest completed financial year. I’m curious to see the uptake of both data services (3G and EDGE) as well as the increased number of low-cost handsets. Just yesterday I read a report of a Malaysian company setting up a mobile phone manufacturing plant in Mozambique, so there very well might be some super low-end phones available soon. I’ll be offline for the next couple days as I hit the road for Nairobi. I’m arriving just in time for the Safari Sevens rugby tournament starting Friday, and will be in Nairobi until the end of the month. If anyone wants to get together, shoot me an email. I thought I’d leave everyone with some links to stories that I’ve enjoyed over the last week. 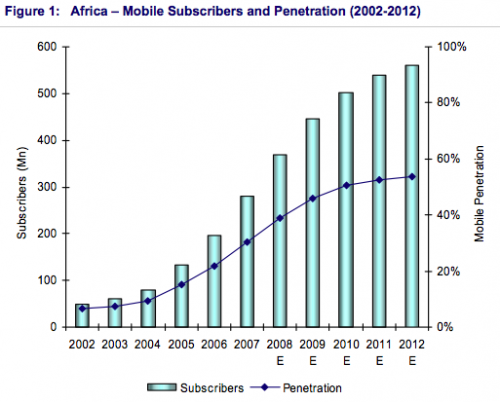 Mobiles in Africa – one of the best articles I’ve read in a long time on the mobile phone in Africa, by Ken Banks. Few people can write long interesting articles, but some have the skill to do it. Ethan Zuckerman writes another thought provoking post on the architecture of Serendipity. myKRO – A new blog about the world of microfinance. They’re looking for contributors, especially from the field in Africa. A nice article on how to get the most out of your thumbdrive from Freelance Switch. 50 Questions asked and answered about Android on ZDnet. Through Mobimii, MXit users are no longer bound to the MXit service. Breaking news by Charl Norman for Mxit users in South Africa.